by Plutarch; Waterfield, Robin; Stadter, Philip A. 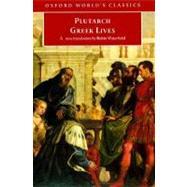 Here, Plutarch introduces the major figures and periods of classical Greece, detailing the lives of nine personages, including Lycurgus, Solon, Themistocles, Cimon, Alexander, Pericles, Nicias, Alcibiades, and Agesilaus. Oxford presents the most comprehensive selection available, superbly translated and accompanied by a lucid introduction, explanatory notes, bibliographies, maps, and indexes.